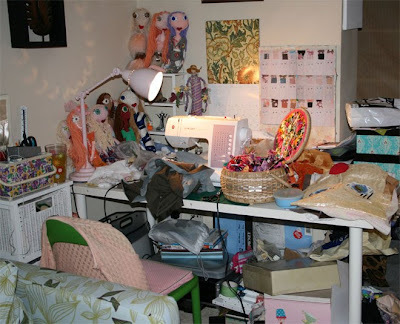 My work space, quite messy, but organised at the same time. I have all my fabrics inside the window box seat to the side of the desk. In the white drawers I have haberdashery bits. On top of the desk in the left hand corner, I have my collection of inspiration figures, such as Tim Burton characters.